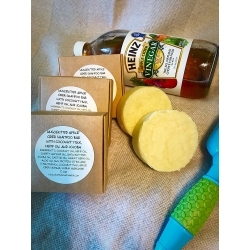 This fortifying Cinnamon Shampoo Bar is made with Rice Water, Comfrey Leaves Extract, Cinnamon powder and Cinnamon Essential Oil and hair loving oils including Rice Bran Oil and Mango Butter. Rice water has amazing hair benefits. It exhibits hair care effects, such as decreasing surface friction and improving hair elasticity. Rice water has inositol, a carbohydrate, that can repair damaged hair, as well as protect it from damage. Comfrey is a natural herb that helps in reversing hair loss. Comfrey is a healing herb so it will not harm your hair but nourish it with essential nutrients. It is also been proven to fight dandruff. Comfrey helps in nourishing and conditioning your hair. Cinnamon contains chemical compounds like eugenol and cinnamaldehyde. These offer antiviral, antifungal, antibacterial and many other benefits which could help with hair problems by preventing fungal and bacterial infections of the scalp. Mango Butter is a great moisturizer for hair. For those who have a difficult time locking in moisture especially during the summer months, Mango Butter is fantastic sealant for the hair. It penetrates the hair cuticle to fortify hair from the inside. Soybean Oil is a high vitamin E content and it will fight off free radicals while also being a helpful antioxidant for the scalp. In each shampoo bar I have added natural silk protein which contains 18 different amino acids that are a very close match to the chemical composition of human skin and hair. First the silk penetrates the hair shaft and skin, and as it dries it imparts a silky soft shine and smooth texture you will love! Also there is a D-Panthenol (vitamin B5) in this shampoo bar which is a highly effective humectant, it has a highly hydrophilic and hygroscopic structure which attracts water from the atmosphere and binds it to various sites along the molecule. Panthenol is not only a humectant, but is also a useful moisturizer and emollient. It spreads evenly on the surface on hair strands, forming a smooth film on the surface of the cuticle. If you have never used a shampoo bar before, please give your hair time to adjust, as the shampoo bar washes away the buildup from your old shampoo. Synthetic shampoos strip the hair of its natural oils, your hair gets used to this treatment and then tries to over compensate by producing more oil. This shampoo bar is absolutely free from SLS, SLES, parabens, petrochemicals, synthetic fragrance & preservatives. No matter the length of your hair, you want to be sure to massage your scalp as you are using the shampoo bar. The scalp produces oils that protect the hair shaft and prevent breakage. So when you are washing your hair, it is just as important (if not more important) to clean the scalp and not just the hair. In fact, it can take a few weeks for your scalp to adjust to the shampoo bar and stop producing excess oil. Conventional hair products continuously strip the natural oils, thereby causing your scalp to produce excess oil. Your scalp will adjust if you are patient. Many people find that once their scalp and hair have adjusted to the shampoo bar, they no longer need any conditioning. If you find that your hair still needs a conditioner, put a little bit of any light oil (sweet almond, argan, apricot kernel oil etc) on your hands and rub it together. Smooth through your damp hair, particularly the ends. How to use: Just wet your hair, rub the bar over hair and scalp, lather, rinse and repeat. This shampoo has no harsh chemicals or sulfates to strip your hair of its natural oils, it just gently removes the gunk. I also recommend rinsing your scalp and hair with apple cider vinegar after using shampoo bar. It helps with pH balance, detangles and adds softness. A dilution of about 1 table spoon in 16 oz water works well. Slowly pour the solution across scalp and allow it to run down length of hair. 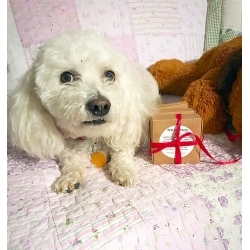 Bug off Neem Oil natural organic dog soap shampoo bar with aloe vera, scented with blend of essential oil (Cedarwood, Lemongrass, Fir Needle) Our dog Charley models this Natural Organic Dog Shampoo with Neem Oil. Discover the magic of Neem together with a blend of essential oils to help keep pests away while you clean, condition and moisturize your fur friend The whole idea of dog washing should be focused on gently removing the dirt in a natural way. In order to avoid chemical ingestion, it is a good idea to treat your pet with natural homemade shampoo bar with Neem Oil. Neem oil has anti-fungal, antibacterial, and antiseptic properties. That is why I use these oils in my dog shampoo recipe. The neem soap will also keep skin issues at bay and help to prevent fungus. I use Aloe Vera instead of Distilled water to make this shampoo bar more beneficial for dog's skin. In dog shampoo bar I have added natural silk protein which contains 18 different amino acids that makes hair very soft and Vitamin B5 (D-Panthenol) which is a highly effective humectant, moisturizer and emollient. Scented with safe for dogs Cedarwood, Lemongrass and Fir Needle EO (Antiseptic, tonifying, circulation-stimulating, bugs off properties). Good for skin and coat conditioning and dermatitis of all types. Flea-repelling). How to use: Just rub the bar over your wet dog to lather .Keep the shampoo away from his eyes and mouth. Rinse and towel dry. This listing is for one bar of about 5 oz each. Each bar of shampoo is individually packaged and labeled in a craft soap box. 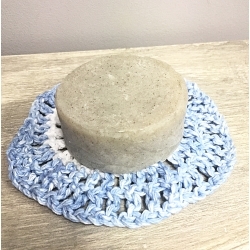 This Peppermint Shampoo bar is made from Aloe juice, nourishing oils including Argan Oil, Menthol Crystals, Silk Protein and White Kaolin Clay. Aloe Vera contains enzymes that promote hair growth. Also Aloe Vera helps to eliminate itchy scalp and scalp dryness by its anti-pruritic properties. Aloe Vera is also used in dandruff treatment. The natural enzymes found in Aloe Vera soothe and moisturize the scalp that helps to eliminate the scalp dryness that causes dandruff. Also Aloe Vera is a great conditioning agent that restores the hair’s shine and luster and leaves the hair silky and smooth. Gorgeous Peppermint Essential oil and Menthol Crystals soften the hair and have a cooling anti-bacterial action on the scalp, keeping it flake free. Argan oil gives new life to dry, tangled, flyaway hair and restores smoothness, strengthens, and gives your hair luster and shine. 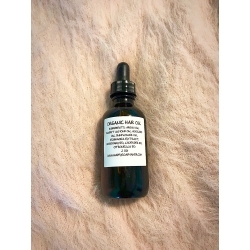 Argan oil hydrates hair and is outstanding for uncontrollable, curly, unmanageable hair. This shampoo is loaded with White Kaolin Clay which is a great conditioning cleanser for the hair, detoxifies and removes impurities from the hair and scalp. Absolutely free from SLS, SLES, parabens, petrochemicals, synthetic fragrance & preservatives. This Tea Tree/Eucalyptus shampoo bar is made with infused chamomile and calendula, nourishing oils including Tamanu Oil, Silk Protein and Egg Yolk. This shampoo bar is loaded with hair loving herbs (chamomile and calendula) which bring out highlights in blonde hair and add sheen to dark hair. Tamanu Oil has so many great skin-healing properties and contains anti-inflammatory and antibacterial properties that help to treat and relieve irritated skin. Promotes healthier, clearer skin. Tamanu Oil helps to revitalize and protect chemically treated hair. Boosts shine and keeps hair frizz free. The vitamins and protein in egg yolks are known to help improve the overall condition and texture of hair. Tea Tree Essential Oil has powerful antiseptic and anti-bacterial properties that help enhance our shampoo's abilities to effectively tame dermatitis, itchy-flaky scalp conditions and may also stimulate hair growth! The Combined effects of Tea Tree and Eucalyptus essential oils stimulates circulation to hair follicles aiding with hair growth. Antibacterial effects of Tea Tree leaves hair smelling fresh and Eucalyptus EO adds shine to your hair. This Unscented Shampoo Bar is made with Apple Cider, Coconut Milk and hair loving oils including Jojoba Oils, Shea Butter and Hemp seed Oil. Apple Cider Vinegar cleanses your hair and scalp and provides a balanced pH to promote hair grown and scalp health. It has antibacterial and antifungal properties that help treat itchy, dry scalp. Coconut milk is a natural beauty treatment used in many hair and skin products to hydrate and repair skin cells as well as to add shine, silkiness and softness to hair and skin. 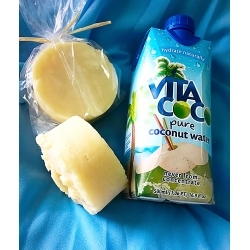 Coconut Milk nourishes your hair and imparts natural moisture to it from roots till the ends. You get much better and well manageable hair. Hemp oil is reach in Omega-3 and Omega-6 fatty acids, good source of plant-based protein. It is also a ceramide oil. Ceramides help to keep the hair cuticle flat and protected from damage. This puts a barrier of sorts in place, which prevents the loss of protein from the hair. Also there is D-Panthenol (vitamin B5) in this shampoo bar which is a highly effective humectant, it has a highly hydrophilic and hygroscopic structure which attracts water from the atmosphere and binds it to various sites along the molecule. Panthenol is not only a humectant, but is also a useful moisturizer and emollient. It spreads evenly on the surface on hair strands, forming a smooth film on the surface of the cuticle. Regardless of the length of your hair, you want to be sure to massage your scalp as you are using the shampoo bar. The scalp produces oils that protect the hair shaft and prevent breakage. So when you are washing your hair, it is just as important (if not more important) to clean the scalp and not just the hair. In fact, it can take a few weeks for your scalp to adjust to the shampoo bar and stop producing excess oil. Conventional hair products continuously strip away the natural oils, thereby causing your scalp to produce excess oil. Your scalp will adjust if you are patient. Many people find that once their scalp and hair have adjusted to the shampoo bar, they no longer need any conditioning. If you find that your hair still needs a conditioner, put a little bit of any light oil (sweet almond, Argan, apricot kernel oil etc.) on your hands and rub together. Smooth through your damp hair, particularly the ends. 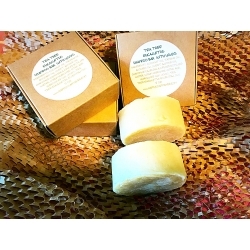 This unscented Shampoo bar is made with Beer, nourishing oils, Silk Protein and Sea Salt and is great for all hair types. 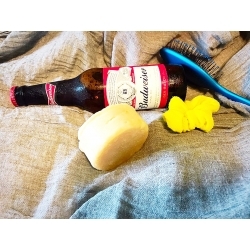 Beer creates a mild, protein rich natural shampoo that adds shine, bounce and body to your hair. The proteins from malt and hops condition hair and help repair damage. Vitamin B complex and natural sugars in beer add body and shine. Also Beer is rich in amino acids which help to coat and repair your hair. Sea Salt is also full of minerals and de-greases hair, removing dead skin cells and dirt without stripping natural oils for a fresh, squeaky clean feeling. This Unscented Shampoo Bar is made with Coconut Water, Goat Milk and hair loving oils including Wheat Germ Oils and Aloe Oil. Coconut water has naturally hydrating properties that help in strengthening the roots as well as improving the blood circulation to the hair follicles. It is also loaded with nutrients like vitamins and minerals that will help in keeping the hair healthy and free from any crises. It also has calcium and protein. Also Coconut Water has anti- fungal as well as anti-bacterial properties that help in prevention of issues like dandruff, infections as well as itchiness that are responsible for hindering the growth. Goat Milk makes hair soft and manageable, good for dry scalp and especially for dandruff conditions. Goat Milk makes scalp healthier and less prone to dryness. Wheat germ oil, which is comprised of long-chain fatty acids that give it emollient properties, to relieve dryness and add softness and moisture to your hair. 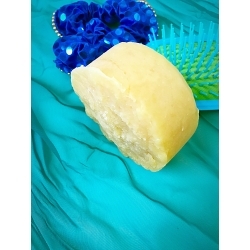 This fortifying Ylang Ylang homemade all natural organic Shampoo Bar is made with Oat Water, St. John’s Wort Extract, Horsetail Grass Extract and hair loving oils including Wheat Germ Oil, Shea Butter and Castor Oil. I use the water from soaking Steel Cut Oats, which contains high amounts of zinc, iron, magnesium and potassium that promote hair grown. Your hair becomes healthier, softer and shinier. It has antibacterial, anti-inflammatory and antiviral properties and this is great for an irritated scalp and helps to avoid dandruff. St. John’s Wort extract contains many biologically active ingredients, vitamins, micro and macro elements. It helps hair to become strong and resistant and promote hair growth. Horsetail Grass Extract contains the mineral silica which works to strengthen your hair and improves the sheen and texture of it as well. Also it contains selenium – a mineral that is essential for the proper growth of your hair. Ylang Ylang Essential oil is an effective natural treatment to reduce hair lose. It helps to balance oil secretion in your scalp and reduce the wet and oily sensation, promotes hair growth, as well as minimizes chances of painful breakouts of the scalp. Shea Butter, being rich in vitamins A and E, is effective in soothing a dry, itchy scalp. It is great for softening and revitalizing damaged and brittle hair. Shea Butter has some exemplary moisturizing properties that provides moisture on dry hair that has been relaxed, colored or heat-treated.